Newest clearance items up on the site. 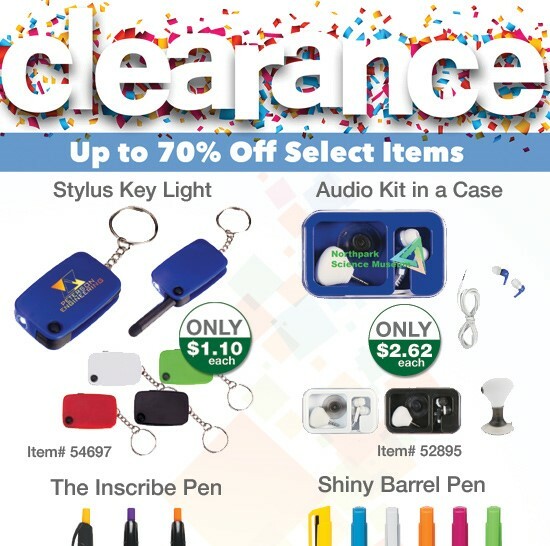 Please register to receive exclusive sales on promotional products and promotional items from Superior Promos. The explosion shook the building. Eric Weinstein, owner of Towel Specialties (asi/91605), was in his office, talking on the phone with a vendor in Australia, when a bang that seemed to signal the apocalypse thundered through the supplier’s Baltimore facility. Cinder blocks came tumbling down around Weinstein’s desk. Quickly hanging up, he rushed out to see what was going on. Down the hall, windows had blown out of the HR manager’s office. Murray Siegel, the firm’s director of marketing, was hurrying outside to survey the scene. What he witnessed looked like a tableau of early-stage Armageddon. “There were big mushroom clouds rising behind the building,” says Siegel. Fortunately, it was not, Towel Specialties would soon learn, the beginning of the end of days or, as Weinstein initially feared, a terrorist attack. A train had derailed from nearby tracks. Chemical cargo combined dangerously and ignited, triggering an explosion that the The Baltimore Sun said was felt throughout the region. While Towel Specialties execs and employees had to evacuate, everyone was okay. Once safety was assured, the supplier’s pros shifted back to their constant focus: their customers. The anecdote tells you a lot about the character of Towel Specialties. So committed to customers are Weinstein, Siegel and their entire team that they didn’t let an explosion and evacuation stop them from giving their all to come through. 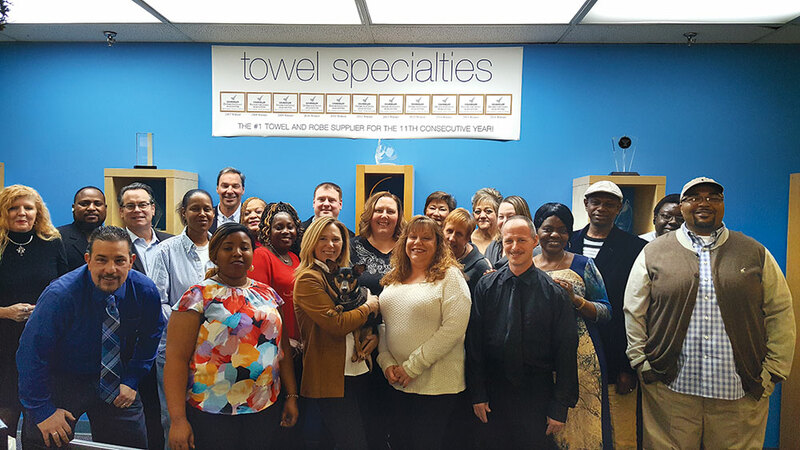 The customer-first effort, delivered on a daily basis, is a huge factor in why Towel Specialties is Counselor’s Supplier of the Year for 2018. The fact that there’s a Towel Specialties for distributors to call on for help is rooted in a creative epiphany Weinstein had in Cartagena, Columbia, approximately 35 years ago. Visiting for spring break during graduate school, Weinstein and his then-girlfriend (now wife, Jody) were at the beach in the historic coastal city. It was summery and beautiful, but also quite windy. Those Caribbean breezes kept blowing Weinstein’s beach towel away every time he went for a dip. Eventually, he plopped rocks on the towel to keep it from taking flight. “I thought, ‘Why doesn’t somebody come up with a beach towel that won’t blow away?’” he says. It hasn’t stopped increasing since. Towel Specialties has driven steady, controlled, organic growth nearly every year, the lone exception being 2009, amid the depths of the Great Recession. The spirit of innovation that inspired Weinstein’s initial creation has helped power the supplier’s success. For example, Jody Weinstein, who oversees product development, travels around the globe to bring fresh designs and ideas to customers. Several years ago, Towel Specialties introduced the now hot-seller called Color Fusion– essentially vivid, full-color process, edge-to-edge decorating for towels and blankets provided at low minimums with quick turnarounds. Back in 2003, Towel Specialties pioneered tone-on-tone printing on colored beach towels. “It’s still a large portion of our sales,” says Siegel. Additionally, the supplier has diversified its ingenuity into other categories, serving up everything from totes and bags to robes and blankets – including the award-winning 4-in-1 Blanket-Poncho-Cushion-Backpack. “We try to raise the bar every chance we get,” says Kanak. Of course, inventive offerings would ring hollow without excellent fulfillment – something the crackerjack production pros at Towel Specialties ensure on every order. And, while those experts work magic behind the scenes, Kanak and the sales and customer service crew are consulting clients, educating distributors on ways they can spur fresh sales with a wide range of end-buyers. As a result, the outreach has taken the supplier’s mainstay beach towel offerings far beyond the beach, inserting them into everything from healthcare companies’ employee gift programs and banks’ incentive initiatives to corporate stores and so much more. The result is increased sales for distributors and Towel Specialties. “Our goal is to be a partner to our clients – to always put distributors in a position to succeed,” says Kanak. The hard work and dedication to customers hasn’t gone unnoticed. Data ASI reviewed as of part of Supplier of the Year evaluations revealed that distributors rank Towel Specialties toward the head of the pack when it comes to everything from service and product quality to conflict resolution. Family. 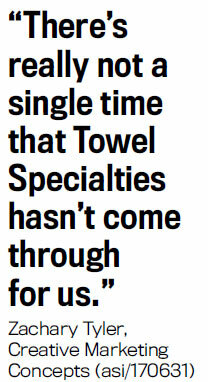 Time and again, the word came up as Owner Eric Weinstein talked about his team at Towel Specialties (asi/91605). But it’s more than just a word, it’s an ethos – a mentality and way of operating that’s an essential ingredient in the Maryland-based supplier’s recipe for success. “Having that family mentality of always doing your best for each other is pivotal to us always being our best for our clients,” says Weinstein. To help create the family atmosphere, Towel Specialties’ leaders make sure to celebrate employee birthdays, hold cookouts, host holiday parties and even give an end-of-season thank-you party. That, in addition to treating employees well on a daily basis and giving them the tools and direction needed to succeed, has bred loyalty. Indeed, many Towel Specialties pros have been with the company for a decade or significantly longer. 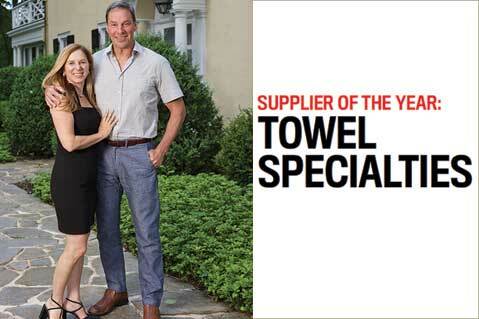 For example, the supplier’s first multi-line sales representative, Paul Sprunk, has been representing Towel Specialties for more than 25 years. Vice President of Sales Shawn Kanak has been hard at work for the firm for more than 15 years. Office Manager Carrie Merritt, Operations Manager Curtis Holley and Marketing Director Murray Siegel are company veterans of about 20 years.